It's nearly lunchtime, we've done a 2 hour presentation and questions session with a friendly audience of over twenty students interested in taking up positions in the UK at the end of summer, I'd say half will probably do it, they might recommend it to friends too which would be fine. Yesterday afternoon we interviewed over a dozen guys already working but wanting to expand their experience and hone their English. 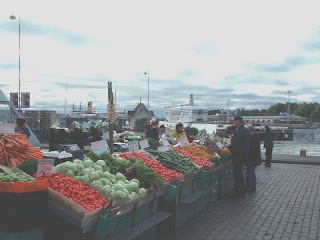 I love Helsinki! Its cold, I think there was a frost last night but the sky is blue and the sun's out it's lovely. 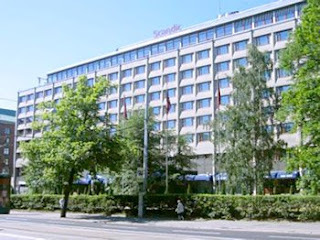 Were staying at the Scandic Continental, it used to be the Intercontinental, about half a mile outside the centre opposite the Finlandia Congress Centre and a beautifully kept park where P got me up for a walk early this morning. Brrr! I told P I needed warming, he said he'd warm me later, I'll hold him to that. 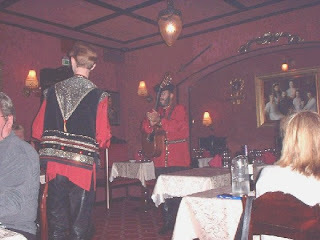 Last night we ate in Russian restaurant, P ate a brown bear steak or at least that's what the menu said, he thought it was a bit tough, I tried smoked reindeer for the first time, good job it's not near Christmas or I probably wouldn't have. We're going to an exhibition after lunch and tomorrow it's a boat trip from the harbour to one of the islands. The harbour here is a wonderful place there's a daily market with fresh fruit and veg and they cook fish brought in daily on huge open frying pans, for me it's the heart of the city. Some photos from my trusty nokia don't do justice, unfortunately someone forgot to pack the digi... now there's reason for a 'reprimand'. You are so lucky to get to travel together. I hope P got you nice and warm in one way or another! beautiful place! I envy you all your wonderful travelling! I'm glad you folks are enjoying your trip. The pictures are beautiful. Daisy and I have done some traveling together Can't wait to do more. Daisy - hi, thanks. My heart bleeds for you and I hope he's with you soon. We have been very lucky to have travelled so so many lovely places. Selkie - hello, lovely to see you. Thank you. 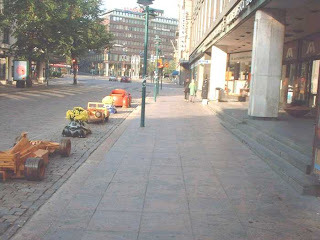 Helsinki is one of my favourite cities, their people are nice and friendly. Davey - Thanks, I forgot to take digi and my Nokia not the best. Where have you and Daisy travelled? Thanks all, appreciate you coming by. Hope your days goes well.